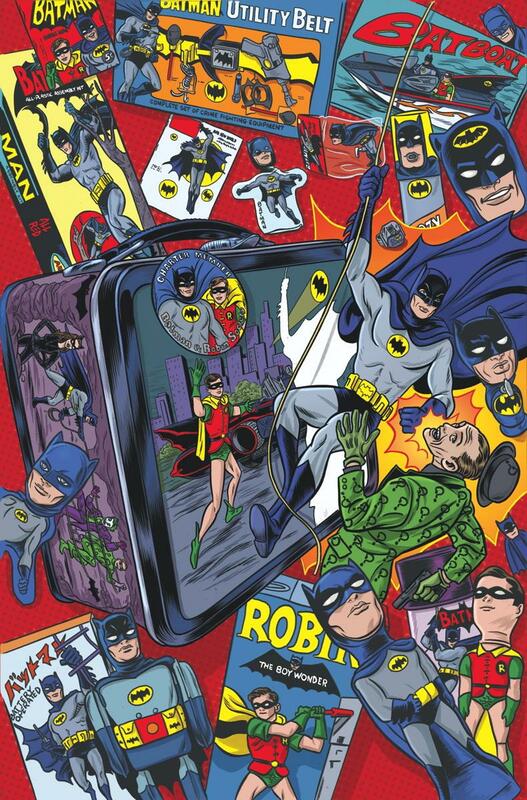 It’s Adam West’s 88th birthday, and his official DC Comics cover artist pays tribute. UPDATED 9/19/16: It’s Adam West’s birthday once again! We re-present artist Mike Allred’s personal tribute. Enjoy! NOTE: If you want to hear more from Mike about his love of all things Batman ’66 — and you do — click here. ADAM WEST’s Top 13 Grooviest Moments as BATMAN — RANKED. Click here. 13 COVERS: An ADAM WEST Birthday Celebration. Click here. An #ICYMI Special: An Interview With ADAM WEST. Click here. I can’t over-exaggerate how big Adam West is to me. He is MY Batman in the way that Sean Connery is THE James Bond. He always will be. As much as I love every incarnation or take on the Caped Crusader, for me, it will always be about Adam West. When I became aware on this planet, “BATMAN-MANIA” from the TV show was in full swing. We kids couldn’t go to the supermarket, the drug store, the gas station, or other kid’s houses without the Adam West Batman being ever-present and represented in some way via all the crazy fun merchandise. It just “was.” In every wonderful way. And the show itself was a daily ritual. Usually two shows a day in syndication. My big brother, Lee, had to suffer with the original airings when you’d see Batman and Robin get in a pinch, and then miss how they got out of it because our folks watched another show on the second night. I only remember that torture once when Robin got swallowed up by a giant clam and I never got to see how he got out of it, for years. I would even miss it in syndication. I started to think I imagined it until I finally saw Adam West’s Batman dig deep and rip Robin out to safety. When I first met Adam West I’d only done the infamous “Batusi Solo cover” which finally saw print as the cover to the DC Solo collection. He didn’t know me from “Adam,” but he couldn’t have been more kind and we had just enough alone time to make it a spiritual experience. I could have met him years before, but I was terrified of my childhood being destroyed if it was a bad experience. After finally meeting, I realized how ridiculous I was and why everyone only ever had gracious things to say about him. A class act all the way! Now, through the eyes of a child, THIS child, the Batman TV show was deadly serious. And if Adam West’s Batman told me to wear my seatbelt or look both ways before crossing the street, I listened and took it to heart. When he, Robin, and Batgirl were in danger I took it very seriously. The last time I was able to spend time with Adam West I was established as his official cover artist. I still pinch myself and doubt the reality of this super swell position I’ve somehow found myself in. Just that Adam West knows who I am thrills me like crazy. Having any kind of association with him is pure bonus. The coolest thing? He personalized several of my original Batman covers to my offspring. ADAM WEST BATMANIA lives on! Cool! Pretty much sums it up for me. I have long echoed those comments of how seriously I took the show. Much like I never thought the original Star Trek and it’s special effects were cheesy or dated, I never thought Batman was camp or silly as people later said. It was deadly serious to me and Adam West was the man. I don’t think I realized to what degree until I got to interview him years later for a children’s show. There were a lot of other reporters from TV stations there that were waiting for me to have fun with Adam West, and I just sucked the air out of room because I treated him so reverentially and just a little bit too seriously. On a personal note, I missed a golden opportunity to do my Frank Gorshin Riddler for him or do my imitation of him for him. I didn’t realize until that moment how much it meant to me and even my adult brain was telling me to lighten up. That shows you what the show and the man did for me. Long live Mr West! Absolutely Awesome! I too feel the same as Mike about Adam and I too had the rare opportunity to meet and speak with him as well. He is a true gentleman. I too would like to see the #30 cover made into a print. Maybe make the Ideal Utility Belt box orange not blue. What is the Batman toy to the left of the lunchbox? It looks like the Ideal puppet but the puppet is already in the center. There are few shows, or music, I will pay for hard copies. Batman 66 is one of them. I had this series pre-ordered for months. Thanks Adam West for great memories and to Mike Allred for the tribute. I CANT BELIEVE THEY;RE ENDING THIS EXECELLENT COMIC BOOK SERIES…THIS IS THE ONLY COMIC BOOK I WAS EVEN FOLLOWING. THE REST WERE JUNK! I HATE MODERN COMICS. 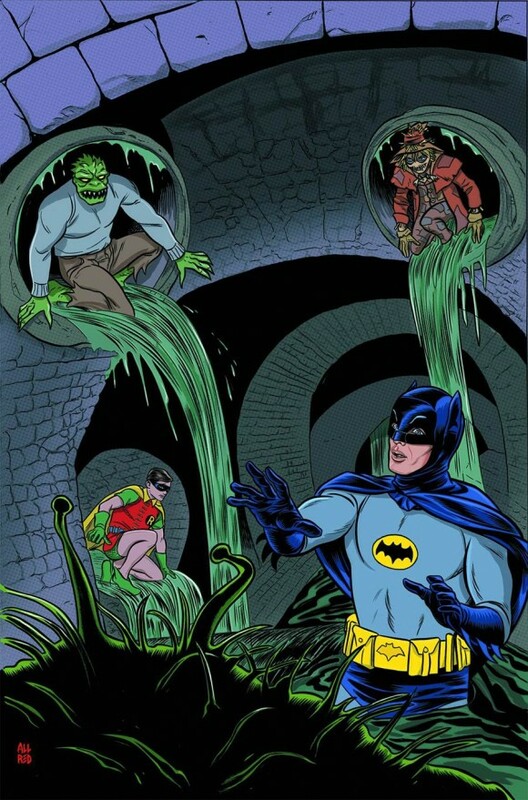 I WANT TO SEE MORE BATMAN 66! 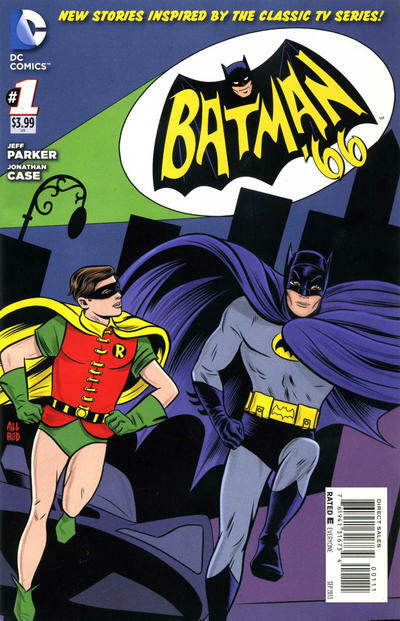 BATMAN 66! BATMAN 66! BATMAN 66! BATMAN 66! BATMAN 66! BATMAN 66! BATMAN 66! BATMAN 66! BATMAN 66! BATMAN 66! BATMAN 66! BATMAN 66! BATMAN 66! BATMAN 66! BATMAN 66! BATMAN 66! BATMAN 66! BATMAN 66! BATMAN 66! BATMAN 66! BATMAN 66! BATMAN 66! BATMAN 66! 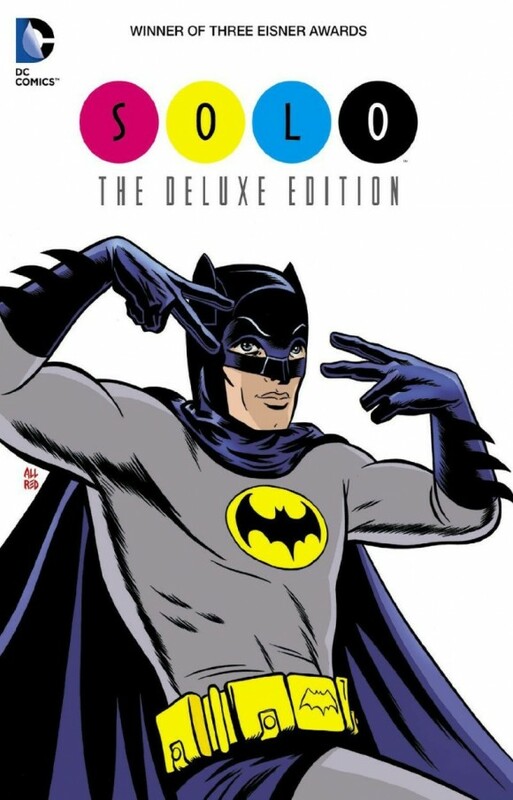 BATMAN 66! Digging the new Avengers/Batman (Steed and Mrs. Peel) crossover now too!